Can’t decide what to get that special racer in your life? Get them a NaroEscape Motorsports Gift Certificate and let THEM decide! Once the order is placed, check your email. 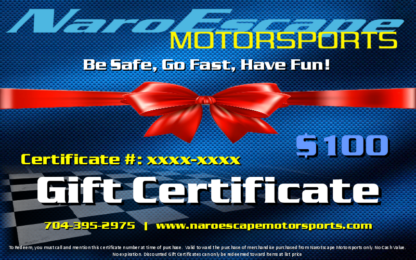 Each Gift Certificate purchased will assigned a Certificate # and will be emailed to you. This is what you will use for redemption. We can send it in a .pdf document format if you’d like to be able to print it out and give it to your special racer personally – just let us know (call, email or note it on the order). Gift Certificates to not expire. NOTE: If a discounted Gift Certificate is purchased, it cannot be combined with any other offer or sale and can only be redeemed toward the purchase of items at List Pricing.